Liquidambar formosana, commonly known as the Chinese sweet gum or Formosan gum, is a tree native to Eastern Asia. There are two very large examples of this species growing side by side in Jungle Gardens. The tree’s distinctive leaves are three-lobed, unlike the five to seven lobed leaves of the North American species, L. styraciflua. The foliage of L. formosana turns an attractive red and yellow in autumn. In its native Eastern Asia, the leaves are used to feed silk worms, and the wood is highly prized for making tea chests. 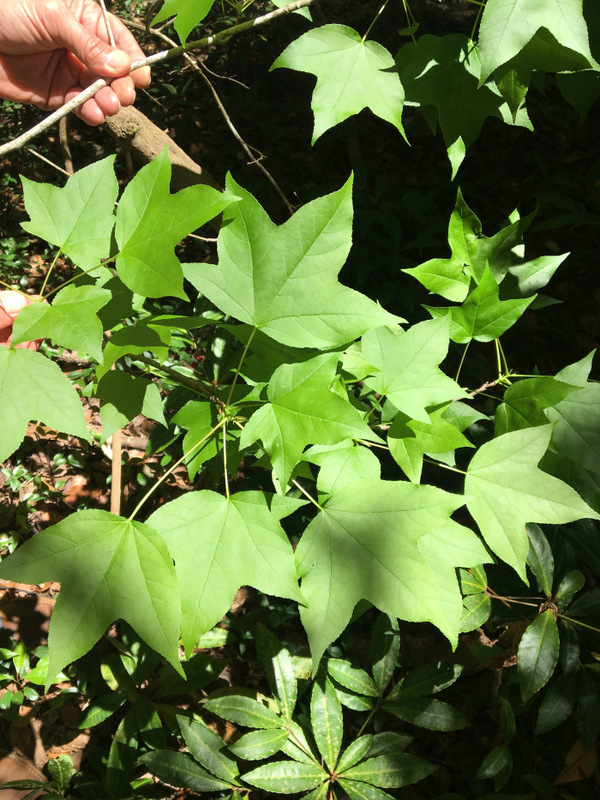 Although Liquidambar formosana is uncommon in cultivation, I have seen it growing at the New York Botanical Garden and similar gardens in the Eastern United States, so it has a wide range of growing zones. The two trees in Jungle Gardens flower every year and produce many gum balls, but I have not observed any seedlings in their vicinity. I estimate the trees to be in excess of 80 years old, they are 24.5 and 22.5 inches in diameter. I will never underestimate the value of exploring for trees in fall months when most are in some stage of dropping their foliage. On December 16, 2017, while exploring a wooded ravine near the Old Nursery in Jungle Gardens with tree expert Adam Black of Peckerwood Gardens in TX, we discovered two trees that initially we identified as L. formosana. Both trees, one in the ravine bottom, the other on the crest of the ravine, are 5.25 inches in diameter, suggesting they are the same age. We first observed fallen leaves. Their bright yellow color and unmistakable three-lobed leaves left little to the imagination as to their identity. Two days later I returned to collect some of these leaves to make a voucher specimen. Both trees had lost most of their foliage; the few leaves that remained on the trees were so high up that none were within reach. As I collected leaves from the ground below the tree I quickly noticed the variable number of lobes. Many leaves had the standard three lobes, but some were asymmetrical with four lobes and others had five lobes. My collection contained an assortment of leaves from each tree that had an inconsistent number of lobes. I immediately became suspicious that these two trees were not L. formosana but more likely hybrids with our native Sweet Gum species. Returning to Archives with the leaves, I photographed, pressed and dried them. A few days later I emailed the photos to Richard Olsen of the US National Arboretum. He immediately confirmed that the trees were hybrids between the two species. He went on to say that such hybrids have been produced only under controlled conditions and were unknown to occur in natural wild populations. The two hybrids are a considerable distance from one of the parents, L. formosana. The other parent, L. styraciflua, is abundant at this location. 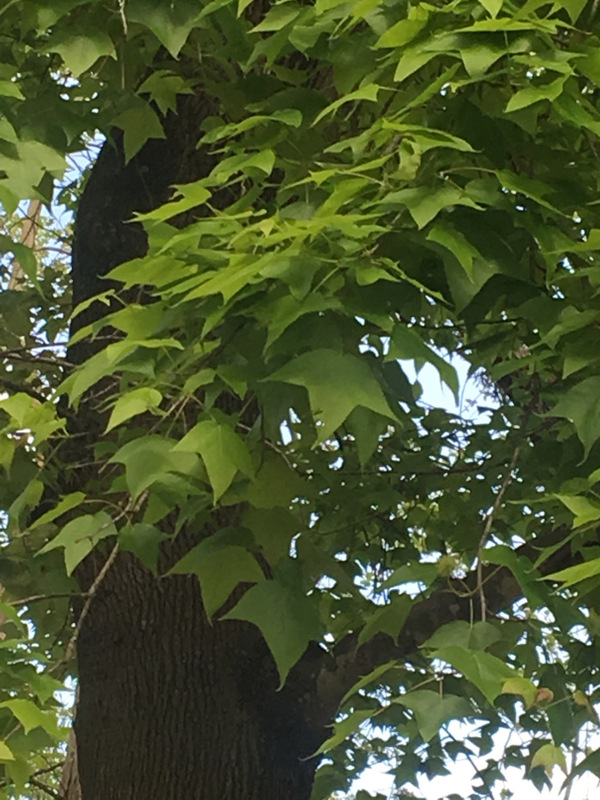 Since Liquidambar species are wind pollinated (anemophilous) trees, the great distance of the hybrids from the large Formosan Gums, would support the conclusion that the male parent was L. formosana and the female parent was native L. styraciflua. Its more feasible for pollen grains to travel long distances than it would be for fruits and seeds. I have repeatedly visited both hybrids all spring and summer, searching for any evidence of flowers. As neither shows any evidence of having flowered and no fruit have been found, I suspect they may be sterile. The two hybrid trees, discovered by chance, were only noticed because of their bright yellow, fallen leaves. Now that I know the hybrid exists on Avery Island, I will continue to look for them, and I am optimistic that more will be discovered.